The Law Office of Reuben J. Donig, is recognized and respected in the legal community for results. We have been serving the Bay Area’s legal needs since 1976, and have a reputation as an aggressive legal team. Dedication, thoroughness, and a commitment to keep you informed, is our goal. In fact, these are cornerstones upon which this firm is built. Our mission is to help our clients receive fair and just compensation for their injuries and losses, without unnecessary delay. That means attorney Reuben J. Donig will always keep you posted on the progress of your case, promptly returning your phone calls, clearly explaining your case to you, helping you to solve your problems, and paying personal attention to you and the details of your case. Cases are handled on a contingency fee-no recovery, no attorney fee. A former law school instructor, attorney Reuben J. Donig has the technical and legal experience you need to get the results you deserve. If your rights, reputation or property have been damaged due to someone's negligence or misconduct, he will find a legal solution that maximizes your recovery while minimizing your distress. If you have been injured, have been in a car accident, or other motor vehicle accident, you deserve the San Mateo accident lawyer who will advocate for your loss. In cases where a loved one has wrongfully died or has been killed, we understand that it will be one of the worst times you have experienced. You may be upset and in dire need of assistance and advice. 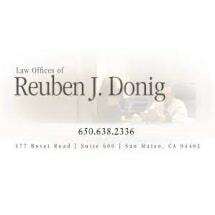 You need a lawyer that recognizes what you are going through and how you are feeling Reuben Donig will do whatever he can to quickly go to work for your recovery. Frequent guest on Television's "Legal Currents"
After the Accident: What should you do? What should you avoid doing?